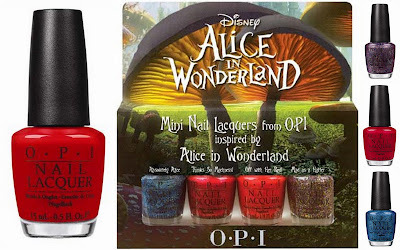 Two winners will each receive 1 set (4 full-sized bottles) of the upcoming OPI Alice in Wonderland Collection. These will be sent to you from Victoria Nail Supply, and they are anticipating a late December arrival. Note the photo above shows the mini-set, but that's the only photo I personally had and didn't want to take one from someone else's site! The prize bottles will be full-sized. Send me an eMail with "December Contest" as the header and be sure to include your eMail address. Entries must be received by midnight, December 20. Followers only, please. I apologize for my lack of swatching and polish pictures, and hope to get some done this weekend. I've been extremely busy with upcoming holiday planning...I have a love/hate relationship with Christmas...love the meaning behind it, the decorating, food, gift giving, music...hate the stress and the commercialism! There's something else I'm very excited about, which has nothing to do with nail polish or makeup, but it's been taking up a lot of my time as well. It's not quite a done deal yet, but if all goes according to plan, it should be by Monday, and I'll be sure to post pictures! I have BB Couture's newest "man" polishes, and I still haven't swatched their first "man" set I received a couple of months ago, so I think I'll be starting with those. Lastly, I changed one of the navigation buttons above to read "New Polish Releases". That link contains some of the upcoming collections, photos and information, and links to posts I have done showing swatches of the polishes I have. I'll update the page whenever I receive new information. omg, wow, these polishes are a lemming for me! thank you, thank you for doing this giveaway! What a wonderful contest. Thanks again. It is a shame about the commercialism of Christmas. What can you do, the stores have to make money. I just hate that it's advertised so early. I think we put a lot of pressures on ourselves to have the perfect holiday. I think everyone just wants to be together. Can't wait to hear your news! I hear you loud and clear on the commercialism of Christmas. Is it awful for me to say I am a little grateful for the recession because it seems to have prompted people to evaluate their priorities and perhaps realign them? For me, I am leaving the commercialism behind. The families have agreed to skip the gift buying and just spend some QUALITY time together. If we do give a gift to someone, we will make it ourselves and for me, those gifts mean more than most - to both gifter and recipient. Best of the Holidays to you and all of your readers as they navigate their way through December. Nice contest! Thank you for doing this for your readers, especially in the midst of all the other things you're doing. This is an awesome contest! I LOVE Alice in Wonderland, because I just adore the Cheshire cat. I know how you feel. Christmas isn't the same to me anymore, it's just too commercialized. I agree with you on the commercialization of Christmas! And I understand about life getting in the way of swatching! Thank you for this wonderful contest, this collection is a lemming of mine :) Looking forward to the BB couture swatches!! woow, such a great contest, I love the prizes! Will you post any of your decoration pictures? I bet you do a lovely job of it! I love Christmas too, I know we've talked about that, and I hate the same things you do about it. I hope it slows down a bit for you! Great giveaway. I send you an email right now ! I love this price ...we will not have it in France...as usual. Thanks for taking the time to organize this giveaway! I've just sent in my entry and would love to win these. Behind on comments so I'll respond with just one 'group' response! Glad to know I'm not alone in me thoughts of the holidays and commercialism. This contest has already received more entries than any previous contests, so I'm thinking this little collection will be a very popular one! Cool! Thanks for the awesome contest! just love this set of OPI polishes. Thank you for this oversome giveaway.